We discover the first parts of the city center on foot. Our historic journey will bring us closer to modern and ancient buildings, streets, courtyards and churches ranging from the Roman times to the Renaissance. The buildings on the Ringstrasse and the surrounding parks are some of the City´s prized jewels, reminding us of Vienna´s glorious tradition as a home to talented artists, architects and scultpors. Today, we will discover Vienna and its diverse districts. In the comfort of a coach, we will cross the Danube into the modern parts of the city. We will see the Vienna International Center, also known as "UNO City", the modern "Gedächtniskirche" (Memorial Church) and the riverside recreational areas "Alte Donau" and "Neue Donau". Then, we´ll visit the historical city centre, across the Schwarzenbergplatz and up to the arresting 19th century structure of the Arsenal. The next stop is Belvedere Palace, where we can stretch our legs and enjoy a promenade of the landscaped gardens, never losing sight of the impressive façade of the baroque palace. 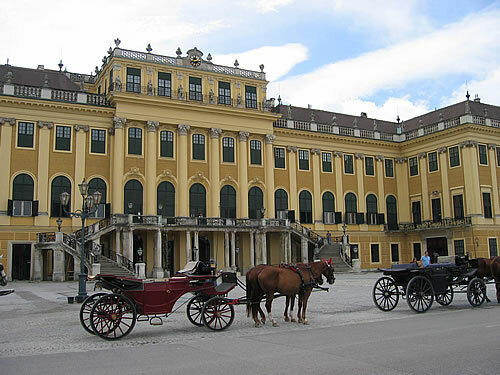 The tour then takes us to Schönbrunn Palace, the most popular historical building in Vienna. We will tour the opulent State Rooms where we will be immersed into the history of the Habsburg dynasty. The view of the exquisite surrounding gardens will remain an unforgettable memory of this trip. In a leisurely walk, we will explore the old town of Vienna, famed internationally as the cradle of baroque and classical music. One of the city´s most famous inhabitants was none other than Wolfgang Amadeus Mozart, and we will visit his Vienna apartment situated in one of the City´s picturesque cobbled streets. Our tour will also take us to the statue of Johann Strauss, situated in Vienna´s City Park.